The following is cross-posted from the Federal Trade Commission Consumer Information blog. See the original post here. Hollywood might have you believe that identity theft means a dozen maxed out credit cards, a warrant for your arrest, and a bill for a spa appointment 2,000 miles away. But in real life, identity theft can be sneakier. It might start with a small credit card charge you don’t recognize. Or a strange new account that shows up on your credit report. Or a letter from the IRS that says you already filed taxes this year. Only you didn’t. If someone uses your information to make purchases, open new accounts, or get a tax refund, that’s identity theft. Only in Hollywood would you fly across the country to track down and arrest the thief. In real life, it might take a while to figure out what’s happened, and how to recover. 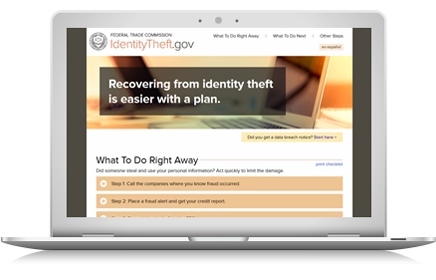 IdentityTheft.gov — a new resource from the FTC — can help. IdentityTheft.gov can help you determine which critical steps come first, and gives detailed advice and helpful resources — like easy-to-print checklists and sample letters. The site also connects you to organizations that are critical to the recovery process, like credit bureaus, the Social Security Administration, the IRS, and local consumer protection offices. A recent Executive Order called for the FTC and other federal agencies to streamline and consolidate resources at IdentityTheft.gov by May 15, 2015. Future enhancements to the site will allow people to get customized help based on their specific experiences. Looking for free identity theft resources to share in your community? To get free publications, videos, and tutorials, visit ftc.gov/idtheft. You’ll also find prevention tips and outreach ideas for community leaders, law enforcement, and businesses.